All owners of steel pallet racking should be mindful of a new standard which incorporates several changes to operational requirements and end-user responsibilities. Despite determined safety campaigns over previous decades, the chilling fact is that too many people leave home in the morning to go to work, and simply never return. In 2009-10, 216 people lost their lives due to injuries sustained while working, and transport and storage (including warehousing) was one of the most dangerous workplaces. Furthermore, there were almost 9000 non-fatal injuries and muscuskeletal disorders in the transport and storage industry alone. No-one deserves to die at work, and importantly great leaps forward have been made in the past few decades in reducing industrial fatalities. And in the introduction of the newly revised AS4084:2012, the supply chain industry is about to take another. There’s no doubt that the new standard is exacting and thorough; experts argue that it’s the most demanding in the world. But to achieve compliance, it also requires changes in company behaviour and imposes new obligations. Introduced in February this year, the new Australian Standard covers the design of steel storage racking systems, and incorporates several changes to operational requirements and end-user responsibilities. 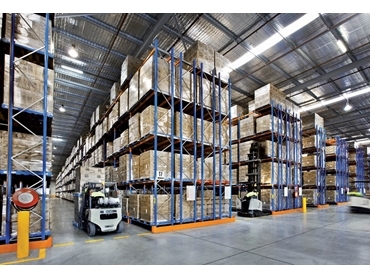 According to Peter Geoghegan, National Engineering Manager with Dexion , the new standard covers around 90% of steel pallet racking being used in Australia. “That includes adjustable static pallet racking, but not drive through, mobile or cantilever racking or racking made of materials other than steel,” he said. Geoghegan says all racking manufacturers and end user customers of racking products have a duty of care to comply to AS4084:2012. “While Australian Standards have no legal status on their own in Australia, if a business was to ignore an Australian Standard without adequate justification, and there was an incident resulting in either injury or death, then a ‘duty of care’ under the scrutiny of the court system would apply,” Geoghegan explained. He says the need for such a rigorous standard is due to the very nature of steel pallet racking that presents unique challenges and dangers, and requires specific governance. “For example, a 1000kg pallet on a typical pallet rack system has approximately 50 times the applied load per weight ratio compared to a high rise building floor system. “That’s why it is paramount that all racking systems comply to AS4084:2012,” Geoghegan said. Geoghegan believes the obligations arising from the new standard will vary from business to business, but says there are four key areas of impact. “Firstly storage density ratios may decrease. The standard requires an increase in flue space between pallets and in vertical separation over 6m. “The upshot of this is less pallets per cubic metre. So while structures will be safer, they may also impose additional costs,” he explained. “There are also changes in statistical analysis of all the testing data. “Australia is now in alignment with world’s best practice, utilising standard deviations and not just averages. “Generally, this results in capacities from the tests to be lower than previously calculated. “There are now more opportunities for economic racking design. The new standard allows a range of tiers of analysis so that better and more insightful design can be achieved. “And finally the new standard has a more definitive repair procedure. “This will help minimise confusion during maintenance and provide a safer workplace environment,” Geoghegan said. “Compliant racking structures will bring not only safety benefits and better racking designs, but will also have tangible commercial benefits for our customers. “This might take the form of more favourable risk analyses by insurance companies, resulting in lower premiums. “Or when audits or due diligence reports are completed for acquisitions a rack system that complies to AS4084:2012 would likely have better asset value,” Geoghegan said. For those companies looking to relocate or extend their racking, Geoghegan recommends that relocating or extending an existing rack structure should be designed to the AS4084:2012 for all the reasons outlined above. “A simple analogy to explain this is in the building industry. If a builder had scaffolding that was manufactured 20 years ago and was installed on a job site today, it would still have to meet today’s standard, not the standard that applied 20 years ago,” Geoghegan said.